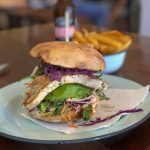 Barrio in Byron Bay is at the top of my list for local dining spots right now. For breakfast, lunch or dinner, it’s become my favourite place to catch up with friends any time of the day for a meal or a coffee or a sundowner with some picadas (snacks). And its location at the Habitat precinct to the north of Byron Bay town centre means I don’t have to find a park in town. Winning. 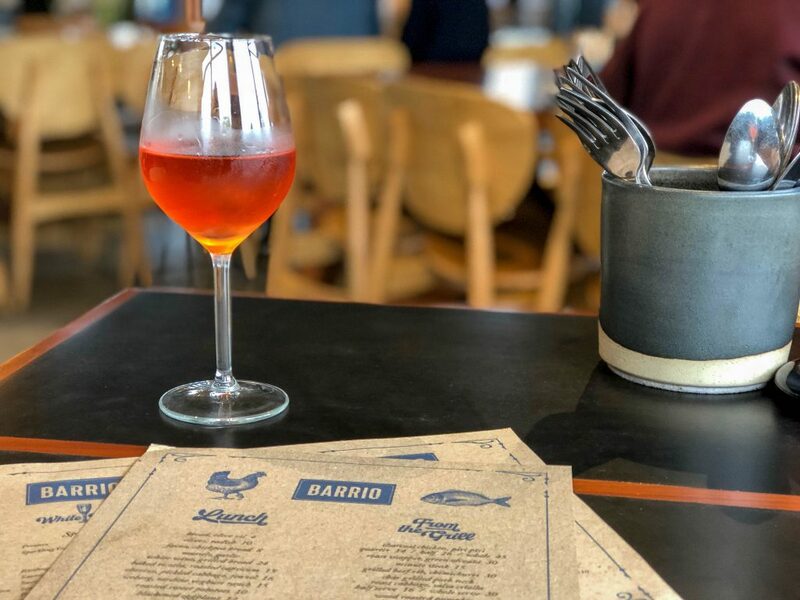 Launched in December last year, Barrio didn’t take long to find its stride; despite a few public grumblings from neighbours. 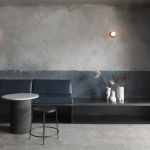 With a pedigree of hospitality experience running the show, including Tristan and Kassia Grier (Harvest Newrybar, Sparrow Coffee), Dan Wyllie (Flinders Lane NYC, Saxon + Parole NYC) and favourite local Chef Francisco Smoje (Francisco’s Table), the Barrio formula was bound to be a recipe for success. 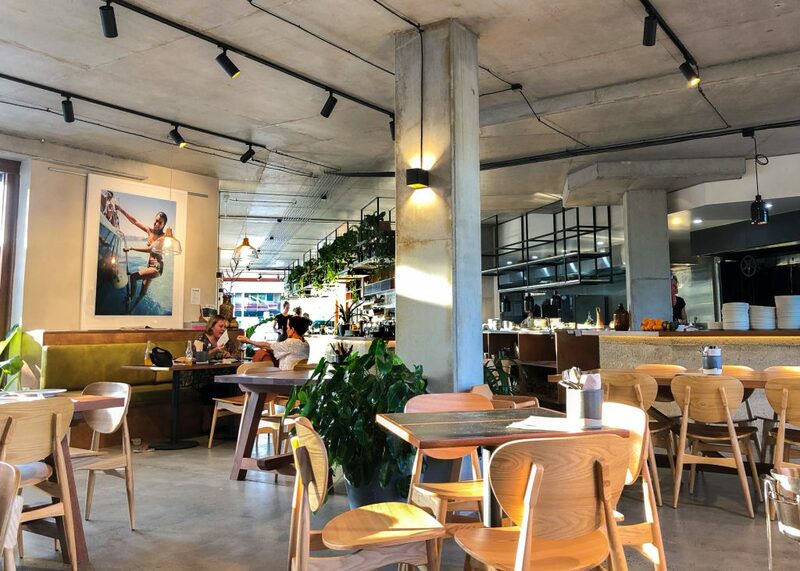 If you haven’t ventured out to Habitat on the north end of Byron Bay’s Industrial Estate, it’s a new development of commercial and residential spaces that coexist in a campus like community. 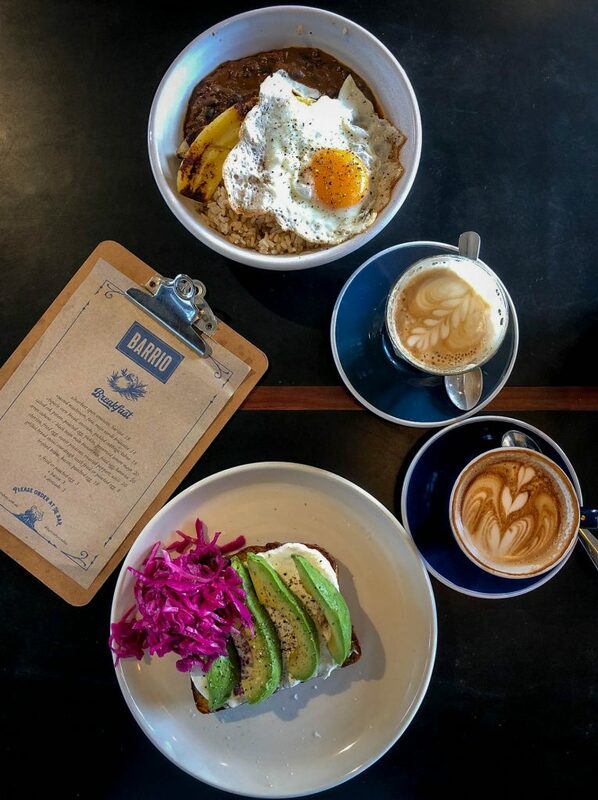 Amongst the retail shops, coworking spaces, offices and studios, Barrio is the sole eatery in the development. The indoor and outdoor dining spaces, including a grassy knoll picnic area, are designed for casual relaxation amongst the industrial facades. 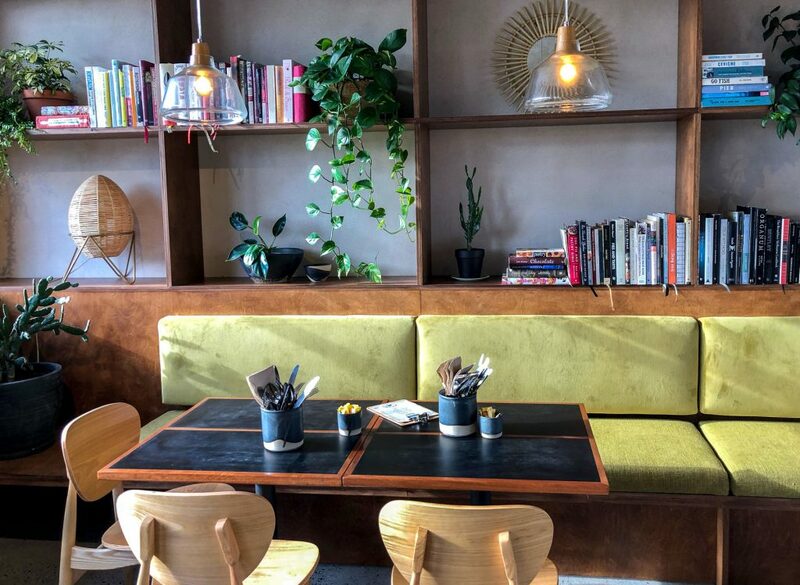 The décor inside is soothing with olive green, timber and charcoal furniture and grey concrete floors softened by shelves of greenery interspersed with well-worn cookbooks. It’s a smart welcoming space that is light and airy during the day and on a Summer’s night. Evenings in Winter are warm inside but can be a little noisy if there are large groups when the doors and windows are closed. (tip – if there is room to sit at the other end of the restaurant where there are a handful of tables it’s lovely and intimate). The main dining area has an open view of the impressive kitchen grill. The canteen style ordering system with buzzers works well for the most part, although some friends have commented that they would prefer table service. Can’t please everyone! Francisco’s Argentinian heritage shines through on the all-day menu. For those who have attended any of his local pop up restaurants with his lovely partner Emma as host, you should know what to expect. 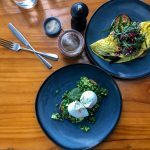 The food is vibrant, with layers of flavour and local ingredients and perfect for a shared table. 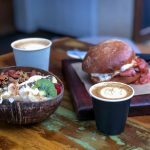 For breakfasts at Barrio there are choices like Chipotle corn bread, avocado, pickled cabbage and labne (pictured – so much better than smashed avo), Chorizo, fried egg, sweet potato, roasted peppers and aioli or the incredible Arox Cuabon (pictured), which you have to try at least once. It’s a black bean mole served with brown rice, fried egg and a grilled banana. Such a great flavour and texture combination. (tip – one suggestion is to add a side of avocado to your order to bring the components of the dish together). For something simpler, there are eggs on toast and cabinet items including mueslis and filled croissants. 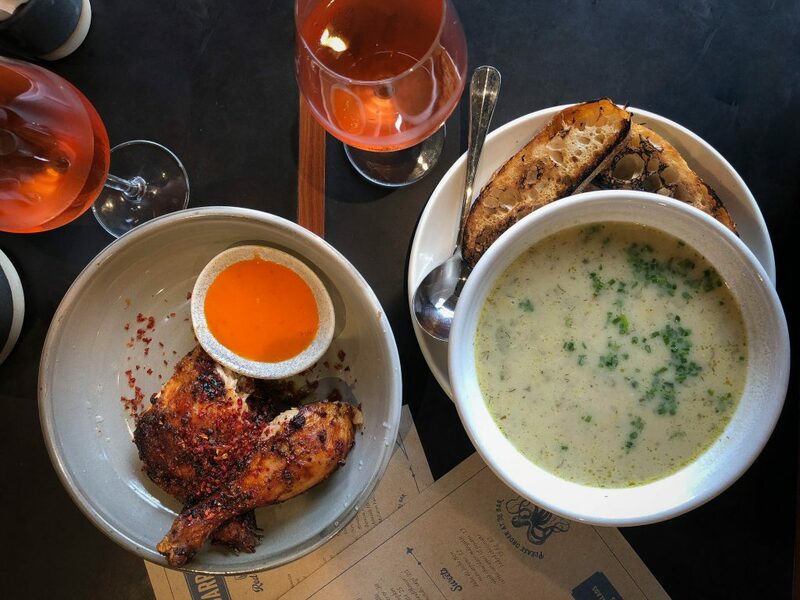 For lunch there are small tapas style dishes like Mussels with garlic and white wine, Baked Ricotta with roasted capsicum, Hot sandwiches like the Cuban of pulled pork with pickles or a Bean mole quesadilla. For something more substantial options from the grill include the Charcoal chicken with piri piri (tip – add a daily salad from the cabinet to your order). There are also incredible Empanadas and Sausage rolls to tempt at the counter as well plus a small dessert menu. The dinner menu is similar to lunch with a few additions. 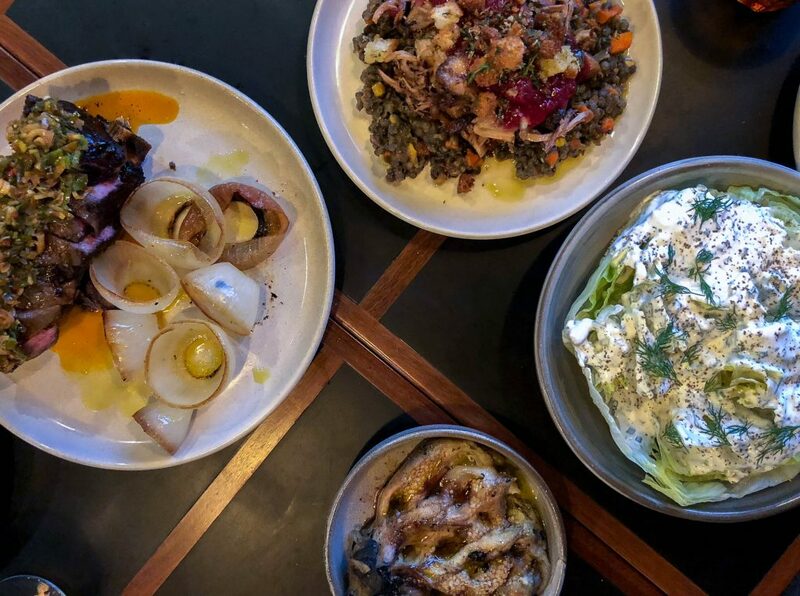 The Grilled beef rib with chimichurri and Roasted half cauliflower with chickpeas, almonds and sage makes a delicious main and for sides I love the Farro with roasted grapes, pickled cucumber and feta. Make sure you take a look at the specials as well. We recently enjoyed a sensational lamb shoulder served with Francisco’s harissa from the specials list. If you are dining in a group of four or more, I highly recommend choosing the ‘Feed Me Menu’ where Francisco makes the decisions for you and selects a menu of his classic and favourite dishes to wow. 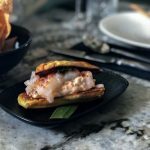 Barrio recently secured its liquor license and has introduced a neat list of beers, cocktails perfect for picadas and wines – the majority Australian. Right now, Barrio in Byron Bay is my pick for food and drinks any time of the day. They are open Monday to Saturday during the day and for dinner Wednesday to Saturday. In Spanish Barrio means “neighbourhood”, which is a neat way to describe the Habitat precinct. I for one am happy that Barrio has landed in the ‘hood and I’ll be back to visit soon and often. My canteen! I’ve worked in restaurant PR for many years with clients ranging from Tony Bilson to Josh Niland. Barrio’s is brilliantly conceived for north coast living. Well conceived, fabulous staff. Love a table order though. Yes – We love a table order too!